UPDATE: Detective City has been moved! Take a look at THIS BLOG POST! Its new home online on itch is HERE! 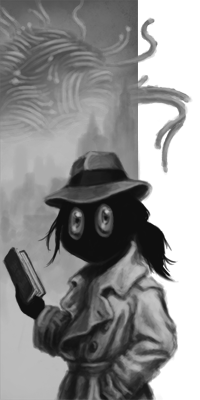 We made a new version of Detective City with ADDITIONAL POLISH! This version of Detective City will run in your browser! It also comes with a downloadable version of the game’s source files. Please feel free to steal our code and/or directly cannibalize our game for any reason. If you’d like to talk to me about this game and how it works, hit me up on twitter at @lmichet. This entry was posted in Games, Writing Projects and tagged detectives, games, interactive fiction, itch.io, writing. Bookmark the permalink.